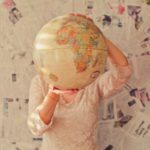 Saana Consulting’s interview series for the TKE offers readers unique, insider-perspectives from top trade negotiators from around the world and sheds light on some of the most pressing questions relating to the UK’s future trade and investment strategy. 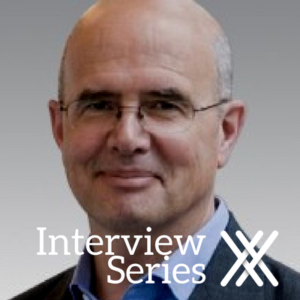 In this series, our experts share insights and lessons for the UK as it seeks to build the capability to navigate the Brexit process, negotiate a network of global trade agreements around the world, and take up its new role within the WTO. 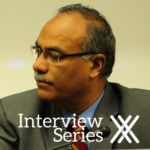 In the second interview of the series, we spoke about Brexit trade negotiation strategies with Mr Don Stephenson, former Ambassador and Permanent Representative of Canada to the Office of the United Nations and to the World Trade Organization, Chief Trade Negotiator for the Canada-India Comprehensive Economic Partnership Agreement, and lecturer at Norman Patterson School of International Affairs and the Centre for Trade Policy and Law. How can the UK Government build its trade negotiation capabilities (quickly)? What sort of training should the new trade negotiators undertake? The central point I would make is that few of the trade negotiators that I’ve worked with have formal training in trade or negotiation, they tended to learn on the job through experience. My colleague, who was our lead goods negotiator for years, studied Middle Eastern history. The lead negotiator for investment protection agreements studied Zoology. My studies were in Communications and I was the head of trade negotiations for Canada for a time. So I would have to stay that negotiation skills can be transferred. Most universities have courses in negotiation skills, which, through observation and practice, can be extremely useful. 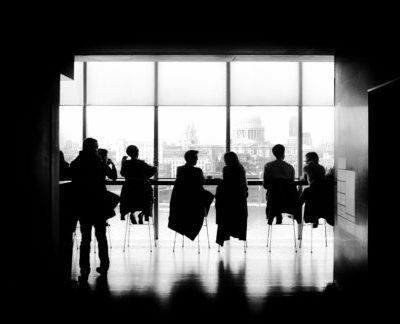 Then I think it’s important to learn from others’ experience and one of the best ways to do that is to bring in experienced negotiators for roundtable workshops and seminars to share insights. 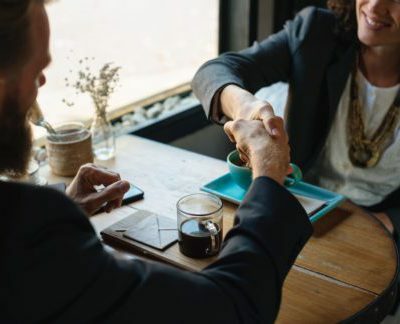 Simulated trade negotiations can also be useful in that they can give a bit of a sense of the dynamic of a negotiation and how to recognise tactics. This should be done in groups, including with people from other departments that are or will be involved directly or indirectly in trade negotiations. In terms of building up a department quickly, I would suggest stealing people. I would steal them from the trade promotion authority because they understand the practical obstacles that importers, exporters and investors face. I’d steal from McKinsey for the same reason. And I’d steal talent from other countries because they will have people who have had experience in trade negotiation or at least trade policy that might find it interesting to gain experience in a new trade department. But again, I would underline the fact that negotiations skills are transferable. Personally, I learned them on the job through experience, observation and practice. Looking beyond up-skilling negotiators, how can the UK Government build its capabilities and capacities across departments to deal with the demands of Brexit? On that point, I think it’s really important to build a ‘community of practice’ that reaches outside of the trade department into other departments. You can’t develop trade policy and undertake trade negotiations in isolation from other departments because you need their guidance on what the domestic interests are and you need them to buy into the outcomes of negotiations when they’re complete. The only way to do that is to take a very inclusive approach in terms of trade policy formulation and to have interdepartmental processes where people are actively and continuously involved in the policy discussion. Transparency and inclusiveness are crucial. In Canada, some areas of trade negotiation are led by people from other departments, so someone from the Department of Finance handles financial services and someone from the Agriculture and Agri-Food Department tends to lead on agricultural trade, and so on. Lateral movement between departments I believe should also be encouraged because it brings different knowledge and experience to the department. Some of the great people in Canada’s trade policy branch have come from the Foreign Service. They are useful not only because they may have had contact with the business community and trade promotion authorities in other countries, but also because they understand international relations and how those things link. Sometimes trade policy is foreign policy. Sometimes trade policy is development policy. And very often it’s social policy. So having the opportunity to have people come in and out of the trade policy department is important. I like to tell the story of a particular trade policy problem we were having where the Americans had won a case against us in the WTO and so we had to try to negotiate an acceptable outcome. The interdepartmental process was completely dysfunctional. Everybody locked into a policy position and started putting up walls of defence instead of working together. When I joined, I was unnerved by what I had heard about this ‘dysfunctional interdepartmental process’. So I went in and said, “Hi, I’m new. This is how I’ll be working; everything I set up as advice, you’re going to see it first and if I’m not characterising your positions properly you’ll get a chance to correct it. I’m hoping you’ll do the same for me. I think our job is to come to a consensus, but if we can’t, at least I’ll be completely faithful to whatever your position is.” Over the next little while I put that into practice. Surprisingly, the process turned around almost immediately and became a collective exercise in looking for the best option. That open door approach worked because it was transparent and it invited people in—I think it’s a powerful lesson. Can you elaborate a little more on the idea of a community of practice and how that operates in Canada’s case? The concept is new in the trade policy space in Ottawa but exists in other fields/professions. 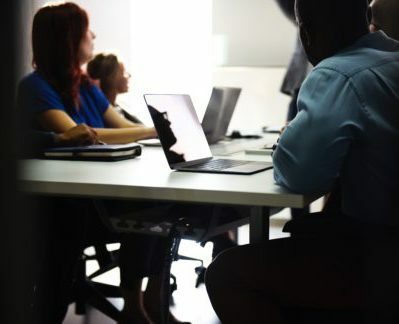 Essentially, a community of practice involves the relevant people across the various tiers of government being able to ‘speak the same language’ and be on the same page in terms of the goals, strategies and objectives of trade negotiations. It also involves everyone having a common understanding that difficult decisions will have to be made in the course of a negotiation. So the idea of a community of practice centres on building a sense of team. 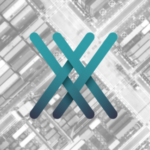 This can be achieved through undertaking shared training activities or building a consensus around strategies and discussing the objectives of a trade negotiation. In Canada, every year we do a two and a half day programme at Queen’s University for mid-level trade policy officers from federal and provincial government departments where they look at theory, case studies and do some practical exercises as a group. This year, I think we had roughly 50 participants, 20 of whom were from our provincial governments, and through this programme we try to not only develop skills but also foster relationships. In your opinion, what would be the best approach for the UK Government to take in terms of industry engagement before, during and after negotiations? How important is it to meaningfully engage with industry? 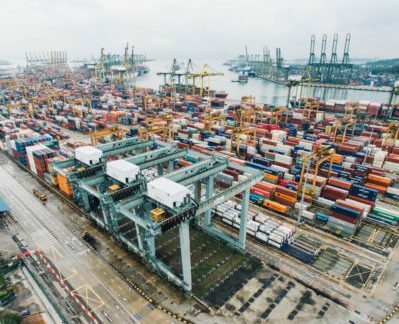 Before and during the course of the negotiations it’s critically important to consult with the ‘clients of trade policy’, which are mostly your importers, exporters, and investors. And not just at a superficial level but also at a deeper level so you can understand what your specific interests are. Then, when you’re trying to define your objectives for the negotiation and taking your negotiating mandate to Cabinet for approval, you have the confidence that you’ve got the interests right. 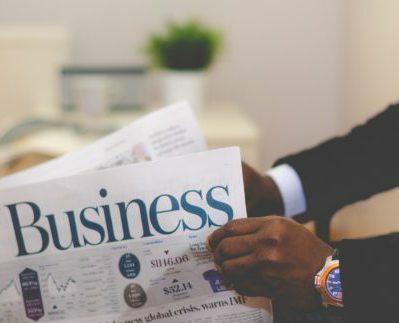 During the course of the negotiation, as more details start to emerge, you then need to seek advice from the business community about whether the possible compromises available will work. Before negotiations begin it’s also important to build or at least gage support for the negotiation and the appetite for spending government resources trying to deepen a particular trade relationship. The government has to try to make sure those who will either gain or perhaps bare the cost, are aware and on-balance agreed. Having a balanced public policy discussion around the trade negotiations is key because there will be voices on all sides and you want to avoid having naysayers drown out the voices of those that will gain from an agreement. At the end of the negotiation, however, things shift fairly dramatically because what you’re trying to do then is get everybody to sign off and voice their agreement that the trade-offs, or the costs and benefits, are acceptable. In Canada, that includes getting our provincial governments to share the burden of defending the agreement together. At the end of the day though, it’s not only about consulting with the business community. The general public need to be kept informed as best as possible and have an opportunity to express their views. There are also very specific constituencies that need to be consulted including those who represent the defence of the environment, the promotion of labour standards and human rights, as well as the defence of cultural expression. What are some key lessons the UK can draw from Canada’s experience negotiating CETA? The first lesson would be—as the UK would know intimately—that the European Commission is a big, heavy machine and negotiating with it will be difficult and slow. That said when it moves, it can move quickly. Pascal Lamy used to refer to the ‘spasms’ in negotiations. That’s sort of how it works. 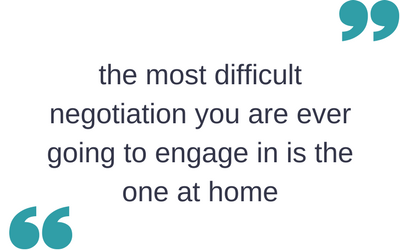 The second lesson would be that the most difficult negotiation you are ever going to engage in is the one at home before you leave to go do the actual negotiating. Luckily for us we only have ten provinces and two territories but even then at the Cabinet table in Ottawa you were dealing with Ministers with different policy objectives and political views. The third lesson is that “it ain’t over ‘til it’s over.” I think you have to try to be prepared for the unexpected because no doubt many unexpected things are going to happen. For that reason you have to continuously work, not just domestically but in your negotiating partner’s country as well, to build positive groundwork for the deal. That being said there are limits to what advocacy efforts you can engage in in somebody else’s country. Nevertheless, there are lots of opportunities to be in discussion with other levels of government, with other branches of the Commission, and with the private sector and civil society groups. And finally, address issues straight up as they emerge and keep working the relationships throughout the process. I guess that’s what Wallonia taught us. Following Brexit, the UK is hoping to negotiate trade agreements (most likely simultaneously) with a number of countries. In a practical sense, how does one handle multiple negotiations at once? Canada is a good example of what happens when you launch a lot of trade negotiations all at the same time. We found ourselves late to the bilateral negotiations game because we have always believed that a rules-based, multilateral trading system produces the most benefits. So we held on to the hope the Doha Round would succeed and jumped into bilateral game late, but when we did we jumped with both feet. Then we were basically negotiating with everybody who might say yes. In the end however, a natural kind of hierarchy arises, so our negotiation with Europe got more attention, more oxygen and more resources than say our negotiation with a less commercially important market. So there’s a natural hierarchy that emerges, not just in the sense of what is viewed as the most important but also what will set the benchmark for how far we’re allowed to go on particular issues in other trade negotiations. For Canada, NAFTA was the template, now the template is more like CETA. So first of all you have a natural hierarchy of negotiations. Second of all you have a template that everyone is working to with minor adjustments for specific negotiations. Thirdly, you get your negotiators organised. 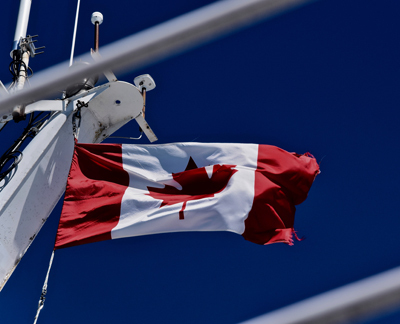 In Canada we use a matrix management approach whereby there are ‘shops’ of subject matter experts across all the areas of a trade agreement including services, rules of origin, and sanitary and phytosanitary rules for agricultural products. These specialised ‘shops’ place one of their experts on the negotiating team for any particular negotiation. If it’s a really big negotiation, then it’s probably the director of that shop that will sit on a negotiating team. If it’s a smaller negotiation, maybe it’s the deputy director or one of the senior offices that participates directly in the negotiation of that chapter of that agreement. It’s a coordinated approach where the whole team feels engaged and it helps avoid people running off willy-nilly causing unfortunate precedents in one negotiation or another. You also benefit from economies of scale. Previously we set up a special trade negotiations office to run a trade negotiation for the regional Canada-US free trade deal and I would council against that approach. 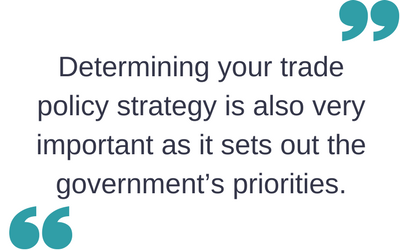 Determining your trade policy strategy is also very important as it sets out the government’s priorities. Fundamentally, like everybody else on the planet, we’re after the big, explosive growth markets in Asia. Then there’s a sort of second tier of still relatively large markets like Indonesia, Turkey and places like that. After that there’s the deals you want to ‘keep up with the Joneses’ so to speak, which normally involve smaller markets where a country might have just done a deal that could hurt some of our exports. We would jump in and see if they were interested in a parallel negotiation with us. And then finally there’s a third category of negotiation that I call ‘keeping up with the Minister’ and that’s where the motive for negotiation is more about foreign policy than it is economic policy. In these circumstances we’re trying to build a friendship or signal support for a country. So there are different categories of negotiation but in the end the one that’s the biggest, that’s going to set the benchmark, and that has all the political intention goes first. That’s just logic. And it’s easy to keep things coordinated if there is a hierarchy, if there is a template and if you use matrix management. When the time comes, how can the UK encourage businesses to take advantage of new trade agreements? A trade negotiator’s biggest fear is knocking themself out for several years trying to get an acceptable deal and then having nothing happen. Simply having an agreement sort of makes the sound of one hand clapping. Governments sound like they’re actually doing the trading and they take the credit like they’re doing the trading themselves, but they don’t. You need businesses and investors to take initiative and take advantage of these agreements. The first step then is to make sure businesses have the necessary information because it’s amazing how many don’t. It’s not always obvious to people that an agreement has been reached and there are opportunities associated with that. It takes time and effort to disseminate information to the relevant people about what the tariff preferences are for specific products in specific industries but it’s necessary. My principal advice to exporters is to put boots on the ground. And my advice for the government is to put people inside those foreign markets that can help, particularly the small and medium sized exporters that don’t have the resources. Canada has our Trade Commissioner Service; the UK has one that’s not identical but analogous. So I would say, more boots on the ground is the principal instrument for helping people actually do the trade. Lastly, post-Brexit, how can the UK leverage its new position in the WTO to help build consensus among WTO Members and drive the WTO’s forward agenda? My first answer is you need to punch above your weight by being helpful. That could be helpful in terms of consensus building but also by doing your homework and coming up with useful ideas. The process in the WTO is ultimately a competition of ideas, so when there are opposing approaches and conflicting interests, somebody has to figure out another way. 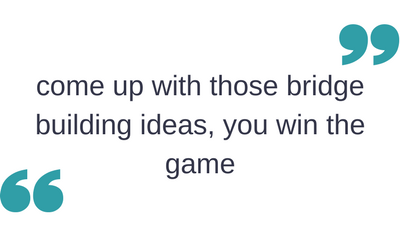 If you spend enough quality time proposing and working with people to try to come up with those bridge building ideas, you win the game. Given the WTO is in a bit of a lull in terms of its forward agenda and people are more active bilaterally and plurilaterally, I think the UK can make itself important. It could do this by actively trying to convene groups around the discussion of new issues, new approaches and the forward agenda to try build some consensus. Perhaps circulating what we call “non-papers,” which are ideas papers that are without prejudice to ones national negotiating position could be useful in this respect. Of course, the UK should build on the work it’s already doing on the trade and development side—it has a reputation in that area and that will buy you a lot of credit with a large constituency in the WTO because most of the members are developing countries. I believe a key challenge in this area is how you help developing countries build their productive capacity. Trade infrastructure is expensive and there’s no one development ministry that I’m aware of that has enough money to do what needs to be done. So I think the challenge is to engage the private sector effectively. Maybe it requires a DFID inc. kind of model where you find opportunities to help reduce the risk for the private sector to get engaged? I would also suggest working on trade finance because that’s a big challenge for a lot of developing countries. Or perhaps focusing on implementing the trade facilitation agreement might be a good one? There are a number of issues on the WTO agenda where you could provide expertise and fairly limited amounts of financial assistance. I like a paper I saw come out of Holland recently called, A world to gain: A New Agenda for Aid, Trade and Investment. It talks about how relationships with developing countries vary at different stages of development. They then breaks down the policy instruments you use during various phases of the transition and have a list of the countries that, for them, fall into each of those categories. This helps them focus and organise themselves around a specific approach, which is refreshing because sometimes it feels like there is no explicit plan in a lot of what the international community is doing in the development space. Don Stephenson joined the Canadian federal Public Service in 1981 and served at the Department of Communications as Executive Assistant to the Deputy Minister, Director of the Arts Policy Division, Director of the Cultural Initiatives Program, and as Cultural Policy Adviser to the Minister of Communications. He subsequently served as Director of Executive Services and of Communications at Consumer and Corporate Affairs; as Special Assistant to the Deputy Minister of Industry Canada; as Director General, Economic Policy at Western Economic Diversification; as Director General, Cultural Industries at Heritage Canada; and, from September 2000 to October 2002, as Director General, Trade Policy Bureau II at the Department of Foreign Affairs and International Trade. From 2002 to 2004, Mr. Stephenson served as Assistant Secretary to the Cabinet, Economic and Regional Development Policy, Privy Council Office. In August 2004, he was appointed as Ambassador and Permanent Representative of Canada to the Office of the United Nations and to the World Trade Organization, in Geneva, where he served for two years as Chairman of the Non-Agricultural Market Access (NAMA) negotiations, a central component of the Doha Round of multilateral trade negotiations. Mr. Stephenson held the position of Assistant Deputy Minister, Trade Policy and Negotiations, from September 2008 until his retirement in September 2011. He continues to serve as Canada’s Chief Negotiator for the Canada-India Comprehensive Economic Partnership Agreement and lectures at the Norman Patterson School of International Affairs and the Centre for Trade Policy and Law. Stacey Mills-Smith is an international trade professional working with TKE Partner, Saana Consulting. 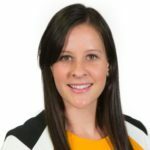 Prior to joining Saana in November 2016, Stacey was the Trade Policy and Research Manager for the Export Council of Australia, where she worked on a broad range of issues across trade promotion, trade policy and trade training. Stacey has also previously worked for the Queensland Government and PwC. She holds a BA/BEcon from the University of Queensland and an Msc in Environment and Development from LSE.